COLUMBIA — The advice of Steve Boros was ringing in Kirk Gibson’s head when the league MVP asked for a timeout and stepped out of the batter’s box, six pitches into his only at-bat of the 1988 World Series. Boros helped compile a 50-page scouting report on the opposing Oakland Athletics, and the report touched on this exact scenario: Dennis Eckersley pitching to a left-handed batter on a full count. The scout’s advice? Look for the backdoor slider. With the report in mind, Gibson stepped back into the box and hit the seventh pitch — sure enough, a backdoor slider — over the right-field wall and into baseball lore. The walk-off home run gave Los Angeles a 5-4 victory in Game 1 of a series that they won in five games. That Dodgers team was the only one to put a World Series ring on Boros’ finger in his 47 years as major league player, coach, manager, scout and front office member. But that historic night was special for another reason. It was the only major league game Boros ever watched in the stands with his daughter, current Missouri tennis coach Sasha Schmid. For Schmid — then Sasha Boros, a high school freshman — the moment was mere confirmation: Dad was always right. Boros played 13 years of major league ball with the Tigers, Cubs and Reds. He began his managerial career in 1970 with the Waterloo Royals, an A-level Kansas City affiliate. One May night during his first season in Waterloo, the game was rained out, so he met two Waterloo fans for dinner. Those fans brought along their daughter, a Trans World Airlines cabin attendant named Sharla Sisson who would become Boros’s wife. Four years later, the Boros, already in their 30s, had Sasha, and it didn’t take long for her to get a taste of athletics. Schmid’s younger brother got the benefit of spending time in the clubhouse and picking his dad’s brain for baseball knowledge. It came in handy; Steve Jr., now 38, works as a scout for the Cubs. Schmid talked baseball with her father, too, but tennis is where they especially connected. The likes of Ivan Lendl, Martina Navratilova, Chris Evert and Boris Becker spent more time on the Boros’ family television than even the baseball greats. The family was rooted in Sarasota but would visit whichever city their father was in during the summers, be it Baltimore, Kansas City or Montreal. In the ’80s, they moved out to California for their father’s managerial positions. But there’s not a ton of family time when the father is occupied with baseball nine months a year. But when he was home, Boros was in parenting mode every morning, no matter how late he returned from the previous night’s game. Schmid, 40 and now a coach herself, sees those challenges from a new perspective. Schmid said one of the reasons she came to Missouri was because of the athletic program’s emphasis on positive coaching and sports psychology. Positivity is an inherited trait for Schmid. As manager, Schmid’s father was labeled “genial” at best and “a wimp” at worst. He was a player’s manager — the type more popular in the big leagues these days. At Missouri, Schmid says she uses an innovative, information-based approach. In addition to using video analysis, she keeps statistics from drills and practice matches. That isn’t common protocol for college tennis coaches, she said. Schmid’s father was also innovative in his use of data and technology. He once hired a sabermetrician to keep extensive data on an Apple computer and was a pioneer in using a stopwatch to time pitchers’ deliveries. In 1978 and 1979, the Kansas City Royals led the league in steals with him as first base coach. In fact, his entire approach to coaching had an effect on the way Schmid handles her current role at Missouri. Choosing work over play paid off for her father during preparations for the ’88 World Series. The night that her father was preparing the scouting report, Dodgers manager Tommy Lasorda was appearing on The Tonight Show Starring Johnny Carson. Lasorda asked Boros and the other scouts to come with him. But the scouts refused. The World Series was beginning in two days. “So then he said, ‘Well at least come down and look at my limo,’” Sharla Boros said. They did. Then, Lasorda left for The Tonight Show, and Boros went back and assembled the scouting report for the biggest home run in Dodgers history. Gibson’s home run led to announcer Jack Buck’s famous call: “I don’t believe what I just saw!” Boros certainly believed it. Boros also coached third base for the Baltimore Orioles the season that Cal Ripken surpassed Lou Gehrig’s record for most consecutive games played. In her relatively short coaching career, Schmid has experienced some memorable moments of her own. As an assistant coach at Iowa in 1999, she helped the Hawkeyes reach the Sweet 16. And she repeated the feat while coaching Stetson, an Atlantic Sun Conference school of 3,000 students that has never advanced in the NCAA Tournament in any other season. Although her third season at Missouri has been a struggle, Schmid has had more positive moments with the Tigers, such as in 2012 when her team took down three-straight ranked opponents. When the Boros moved to San Diego, the house they chose had one big selling point: a neighborhood tennis court behind the backyard. Schmid’s brother remembers times when she would return from a first-round junior tournament loss and immediately go to the backyard court with her father after they completed the two-hour drive from Los Angeles. Schmid started improving. She advanced in tournaments, got ranked and started hearing from college recruiters. Once Schmid started moving up in the rankings, she hit another wall: future top-ranked tennis player Lindsay Davenport. Schmid frequently faced Davenport in regional tournaments. She never won those bouts. When Schmid started playing tennis in college at Iowa, she found a new pool of players and was able to gain traction once again. Her freshman year in Iowa City, however, she tore her anterior crucial ligament and missed the rest of her season without possibility of redshirting. 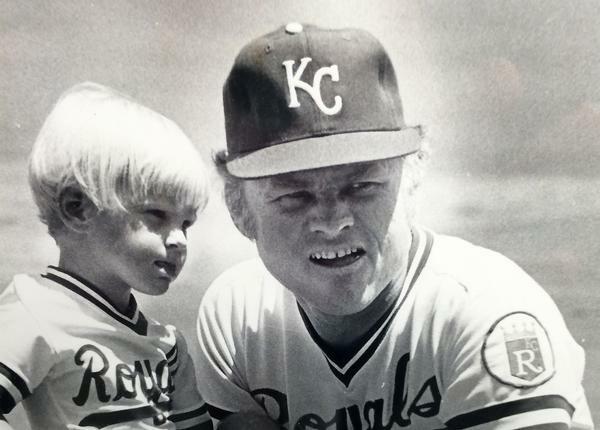 Her father was coaching third base for the Royals at the time, and he had future hall-of-famer George Brett give Schmid a call. Brett had recently undergone his third knee surgery. After graduating in 1996, Schmid, a political science and journalism major, stepped away off the court and into White House for a prestigious internship with first lady Hillary Clinton. Schmid became disenchanted with government’s “inbred power structure” during her nearly five months in Washington and decided she needed a change. She became the assistant coach at Northwestern, a position where she could enact change on a smaller but more intimate level. But she didn’t abandon her love of government entirely, receiving her law degree from Iowa in 1999 after returning as assistant tennis coach. Schmid went 132-101 in 10 seasons at Stetson but left the DeLand, Fla., school in 2011 — less than a year after her father died of cancer. Sharla Boros, who lives in DeLand, helped raise Schmid’s daughters, Lucy and Lily — now 8 and 6, respectively — but wanted Schmid to make the leap to the Big 12. With the Dodgers down to their final out in the first game of the 1988 World Series, the Boros’ son left, hoping to beat the crowd. When Eckersley walked Mike Davis, he tried and failed to reenter Dodger Stadium. He was in the parking lot when Gibson hit the home run. Schmid’s father, meanwhile, had his daughter right by his side. This entry was posted in Columbia Missourian, Columbia Missourian Sports, Mizzou Sports, Mizzou Tennis and tagged Best Of, features, profiles. Bookmark the permalink.